Soon-to-be married couples all know the struggle that comes with wedding planning. But who knew that something as simple as the catering menu needed so much thought and attention to create? As hosts for the said event, it is your responsibility to come up with a food menu that would suit the occasion. 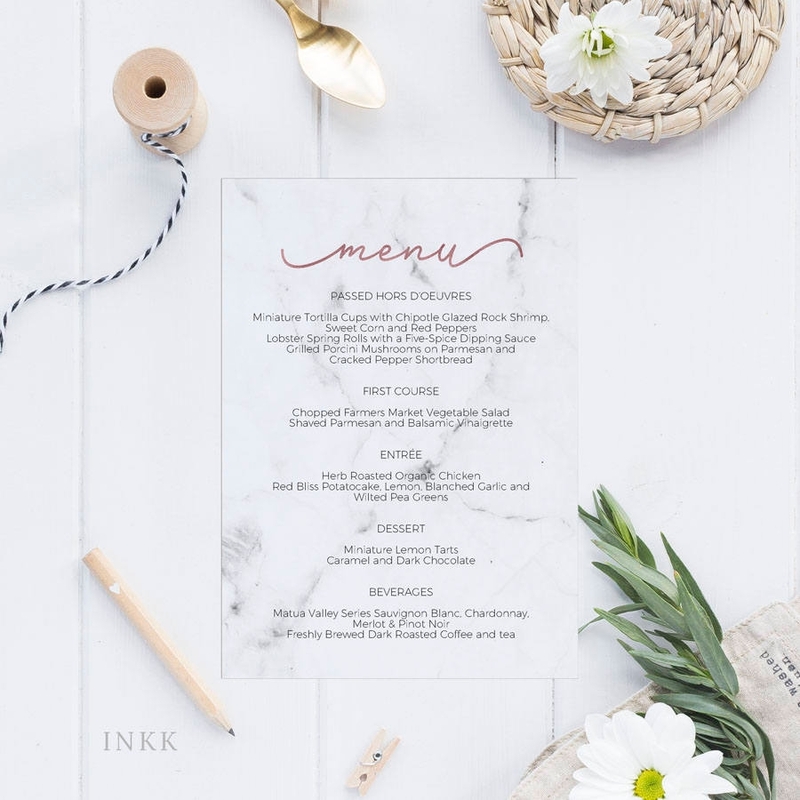 From the menu items to the menu design, you need to make sure this wedding piece highlights the true essence of the celebration in the best possible way. When planning a wedding, it’s always good to set a budget for every aspect of the event. This includes the wedding dress, venue, decorations, chairs, and most importantly, the food. You may also see sumptuous seafood menu examples. Unfortunately, nothing comes cheap these days, especially if you’re hiring a caterer for your reception. Being on a strict budget means scrimping and skimping to your last breath in order to get the best out of your dollar. Prepare your own meals. While this may require a lot of time and effort to put together, it’s actually a clever way to save a good amount of money from your wedding fund. 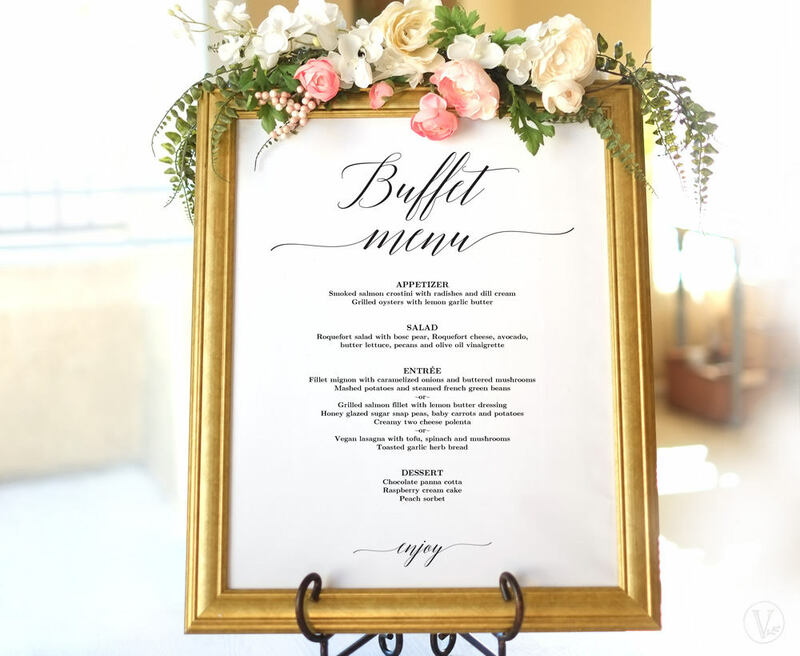 Some caterers tend to charge inflated rates for the appetizers alone, and for a soon-to-be-married couple on a tight wedding budget, this isn’t worth the risk. You may also like chinese food menu designs & examples. Don’t hire servers. It might seem fun (and classy) to have servers walking around with a tray of appetizers on the palm of their hands, but this would also mean a few extra charges to your bill. Most guests pay attention to the food itself, not how these are presented to them. Keep it simple. After the ceremony, your guests will probably be hungry by the time they reach the reception. Since the celebration won’t start until the bride and groom, along with their entire entourage, arrives, then guests won’t mind munching on some crackers, cheese squares, chocolate bars, peanuts, and fruits while they wait. You can also twist things up with a few deviled eggs, a spinach dip, cheesy quesadillas, or maybe even a roast beef and cheddar tortilla pin-wheel for guests to savor. You may also check out dinner menu samples. Avoid sit-down dinners. For some couples, it’s all about mingling with other guests than sitting down to devour a full course meal. Serving heavy appetizers instead of organizing a sit-down dinner has become a popular trend in recent years. This is a great way to encourage interaction among guests, and save a couple hundred dollars on meals as well. 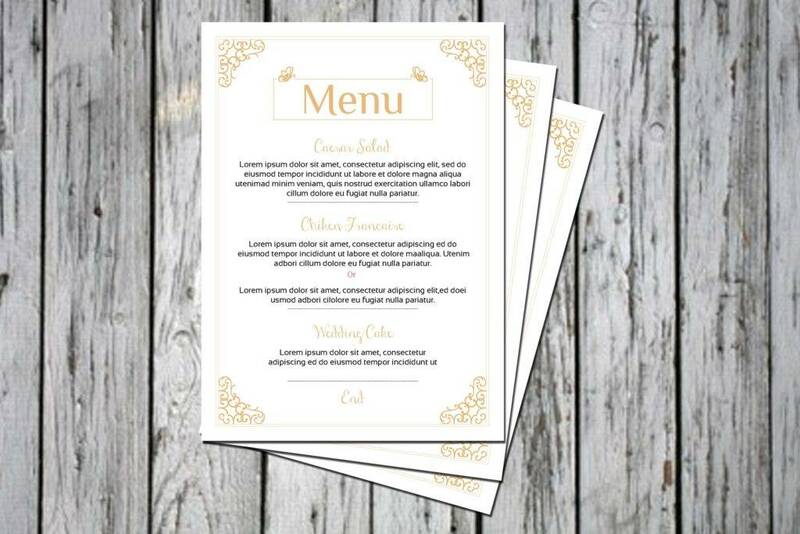 You may also see takeaway menu designs and examples. Compare plated and buffet meals carefully. Unfortunately, it’s hard to tell which is a better option in terms of being ‘money-savers’: a buffet table or a plated meal. Caterers usually offer varying rates, depending on their services and the type of food available for each option. The best thing you could do is to check the prices of both options, see which is of better value, and choose the option that would suit both your budget and preference. You may also like examples of lunch menu designs. Cook your own meals. No one would really care if you serve homemade dishes at your wedding in fact, some people might just appreciate it. Catering can be quite costly for some couples, which is why choosing the most economical option would be a wise decision to make. You can arrange a huge cooking party the day before your wedding and have the best cooks in the family prepare their signature dishes to share with guests. You may also check out menu card samples. Don’t serve off-season dishes. Dishes with out-of-season ingredients are likely to cost more than they usually do. The food might be transported from longer distances, or they could be sold at inflated prices at the local market. Since most food options are seasonal, you may want to stick with those instead. Select a venue that allows outside catering. In-house catering can sometimes be more expensive than independent caterers. If you have a caterer in mind that you wish to have at your wedding, then make sure you’re given the green light by the management of your chosen venue. Otherwise, you may end up paying extra charges for this. You might be interested in cafe menu designs. Arrange a candy buffet. Go to the nearest supermarket or drugstore and pick out packs of candy you want to serve at your reception. Preparing a special sweets bar is a common wedding practice these days. Here, you can pull together a table filled with a vast variety of candy, chocolate, cookies, and any other sugary delights. This allows guests to choose from a wide selection of goods to satisfy their sweet tooth. You may also see barbecue menu examples. Use smaller servings. If you have your eyes set on a particular type of wedding cake that costs more than what you plan on spending, check if you could downsize the cake and serve it in smaller portions. Perhaps you could strike a good deal with the baker, who could offer you these slices at a lower price. Consider a cupcake cake. Simple notice how some birthdays and weddings serve cupcakes instead of a three-layer cake? That’s because they’re sold at a much cheaper price. You could have the baker create a beautiful tower display of your favorite-flavored cupcake for every guest to enjoy. You may even let guests take home a boxed up mini cupcake of choice as a wedding favor. Organize a daytime wedding. Breakfast and lunch meals usually cost a lot less than those served during dinner time. As long as you can keep your guests happy, then you’re free to serve whatever you want to. You may also see pizza menu samples and examples. Bring Your Own Beverage (B.Y.O.B.). Before signing any papers for your wedding reception venue, make sure to ask if they allow a B.Y.O.B. setup. By bringing your own drinks and beverages, you wouldn’t need to settle for the inflated prices that a hotel would offer if they were to provide such service. Invite fewer guests. When creating a wedding guest list, you always need to make sure it meets your proposed budget and venue capacity. A huge chunk of your money goes to the food alone, so you need to be practical with your number of invites. Most catering services charge clients by the head count, so inviting fewer people would mean a lower food bill as well. This also applies to the money spent on creating wedding invitations for guests. Watch out for hidden fees. When your total bill exceeds your expected computation, then it might be because of the hidden fees that some venues and caterers charge without your full knowledge. It’s always best to coordinate accordingly with the management of the venue and your wedding planner before finalizing any decision. You may also like salad menu samples. Set a time limit for the open bar. Everyone loves a good open bar, unless you’re responsible for footing the bill. If your reception is proposed to last for four hours or so, then you can have an open bar for the first hour or two. Guests are likely to have a drink once they arrive at the venue, and since this occurs before the meals are served, some individuals would rather skip the second drink. Another smart move is to close the bar during dinner time. Most guests would be too busy eating and conversing with others to even think about having another glass of martini. You may also see pasta menu designs and examples. Serve wine and beer. Provide guests with two types of alcoholic beverages to choose from: wine and beer. This way, guests can still enjoy a nice touch of alcohol during the party, while you wouldn’t need to worry about paying extra for liquor. If you want to serve a variety for each category, then you can separate the wine menu from the beer menu for convenience. Consider Non-alcoholic beverages. If you aren’t a huge fan of alcoholic beverages, then you might want to consider offering frozen drinks and smoothies to guests instead. This serves as the perfect refresher for individuals of any age. Offer a single signature drink. If you wish to serve liquor at your wedding, then decide on a single signature to serve at the reception. Maybe you and future spouse have a favorite drink you’d want to share with guests. Even if it’s not something people are familiar with, it would be fun to see the look on everyone’s face as they take in every drop of alcohol. You may also check out coffee menu examples. There are countless ways to save money on food and beverages to serve at your wedding, without feeling the need to sacrifice style and comfort, and prompting guests to leave with an empty stomach. What matters most is your ability to exercise these techniques, without looking like a complete cheapskate in front of party guests. You might be interested in typography menu examples. One of the biggest decisions ever made in wedding planning revolves around the food at your reception. After all, feeding a room of 150 people isn’t going to be cheap. So when selecting food items for your wedding menu, there’s no harm in being fussy about it. So, would you choose to follow the latest food trends, or would rather stick with your own personal preferences? As a meat lover, serving an all-meat course meal may seem like the most tempting idea in the world. This is the same for cheese lovers, pasta lovers, dimsum lovers, and chocolate lovers. But when planning a wedding, or hosting any event for that matter, you also need to think about other people. Just because you’re overly keen on a certain food type doesn’t mean other people will be, too. Be sure to offer a wide a variety of food options to choose from in your menu, including a vegetarian option for guests who don’t eat meat. You may also see printable menus. Furthermore, you also need to be aware of common food allergies that may be a significant ingredient in some dishes. Say for example: peanuts. Since many people are allergic to peanuts, you might want to inform your caterer ahead of time to ensure that the necessary adjustments are made before the big day. You also need to ensure there are at least two kid-friendly options available on your menu for the sake of your younger guests and their parents. You may also like examples of kids menu. As mentioned before, keep it as simple as possible. Complicated dishes require a great amount of time and energy to assemble for every platter. Although this is something that should concern the caterer rather than the bride and groom, imagine how long it would take for them to get the food out to guests. If they prepare the food a day before the event, keep in mind that some dishes are better served fresh. Anything prepared in a rush can also affect the quality of its outcome. You may also check out italian menu designs & examples. As for events with a buffet setup, while there may be servers assigned at each station, imagine how long the waiting line would be if people had to prep their food on their own plates. This is only acceptable for dishes that do require self-service, such as salads and the like. Serving raw food can be extremely risky in any circumstance. Though a raw steak can make anyone’s mouth water, if it isn’t done right, then this can lead to a potential food poisoning disaster. The last thing you would want to worry about is your friends and relatives being admitted to a nearby hospital. And if you and your future spouse end up having a bite as well, you could be spending your honeymoon inside the hotel bathroom. You might be interested in finest wine menu examples. But if you’re itching to have oysters as part of your wedding menu, be sure to find a caterer, or probably somebody you know, who is an oyster connoisseur. Having an expert pull it off without a hitch can save you from any probably food emergencies. Bite-sized burgers and mini tacos might seem like a fun concept for an appetizer or cocktail hour, but when it comes to the main course, you need to serve something more substantial. Mini versions of certain dishes are only good as a snack to munch on before the actual celebration starts, but they aren’t exactly the type of dish that can fuel a person up. You may also see spa menu designs and examples. Focus on preparing enough food for everyone to enjoy. Even if you are on a budget, you still need to make sure guests are attended to accordingly. With all the fun and merriment going down at your wedding reception, people are bound to get hungry somehow. 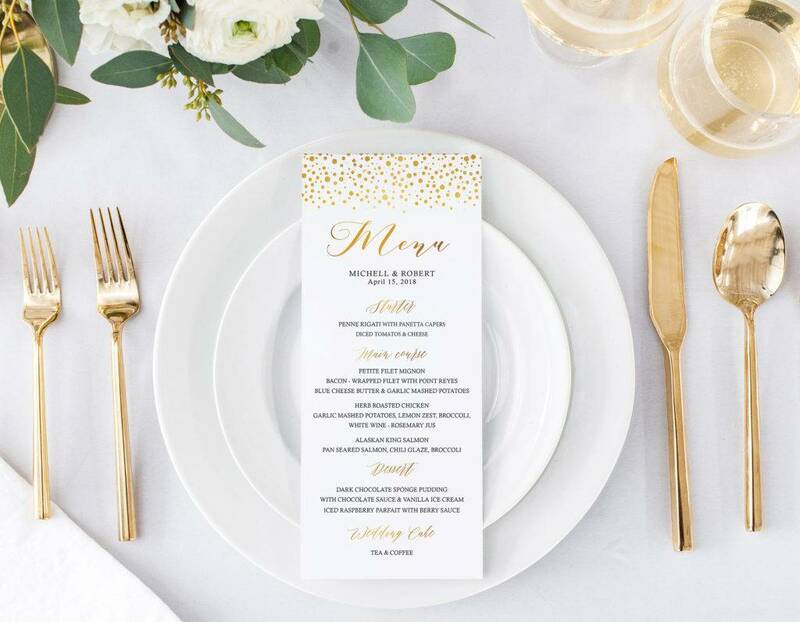 The primary reason why guests come to your wedding is to celebrate the joyous occasion with friends and family, not to taste test every single dish at a restaurant’s food menu. They’re not looking to spend the whole night filling themselves up with different food servings, especially when they’re wearing a body-con dress, or perhaps even a tight suit with their inner polo inserted with a belt. Otherwise, they could end up busting a seam while trying to reach for another brownie at the desert table. You may also like salon menu designs and examples. For everyone’s sake, limit your menu to about three courses. Aside from what was mentioned earlier, estimating an appropriate ratio for your number of guests and the food served ensures that excess food won’t go to waste. Maybe you and your partner are avid travelers who have tried some of the most exotic dishes in places like Thailand and Malaysia. Unlike other people, you both enjoy these delicacies and hope to serve them to guests at your wedding reception. First things first, this isn’t an episode of Survivor or Fear Factor, so not everyone would be too eager to try something that’s completely foreign to one’s taste buds. There are plenty of universally appealing options that would better suit the appetite of the majority, so you need to make sure your menu stays as guest-friendly as possible. Whilst you are entitled to your own food choices, you still need to make other substitutes available in order to make up for the exotic eats. You may also see catering menu examples. A squid ink pasta and a squid ink risotto might sound delicious to many foodies, but a formal event is no place for a disaster-prone dish. With nearly everyone dressed in white, along with multiple photo ops here and there, guests would be mortified when they find photographs of themselves with toothy, ink-stained smiles. Bear in mind that a wedding celebration is not the time to test a person’s spice tolerance. Dishes that leave a tingling feeling on the tongue would do, but anything that could potentially lead to tears and heavy breathing must be avoided. You also need to consider the fact that not everyone can appreciate a spicy meal, especially when their tolerance level is lower than others. People would rather cry about how magical the whole ceremony has been, not because their mouths are burning from a peppery sensation. You may also like restaurant menu designs & examples. Sauce-covered meal options aren’t exactly the best type of food to serve at a wedding. Besides being incredibly messy, we’re pretty sure no one would even dare to pick up a sloppy joe while being surrounded by a group of beautifully-dressed people. Even the servers would have a hard time carrying around these dishes on their small food trays! You may also check out examples of bakery menu. Since you are given the authority to select the type of dishes to be served at your wedding, consider this as a chance to just have fun with it. 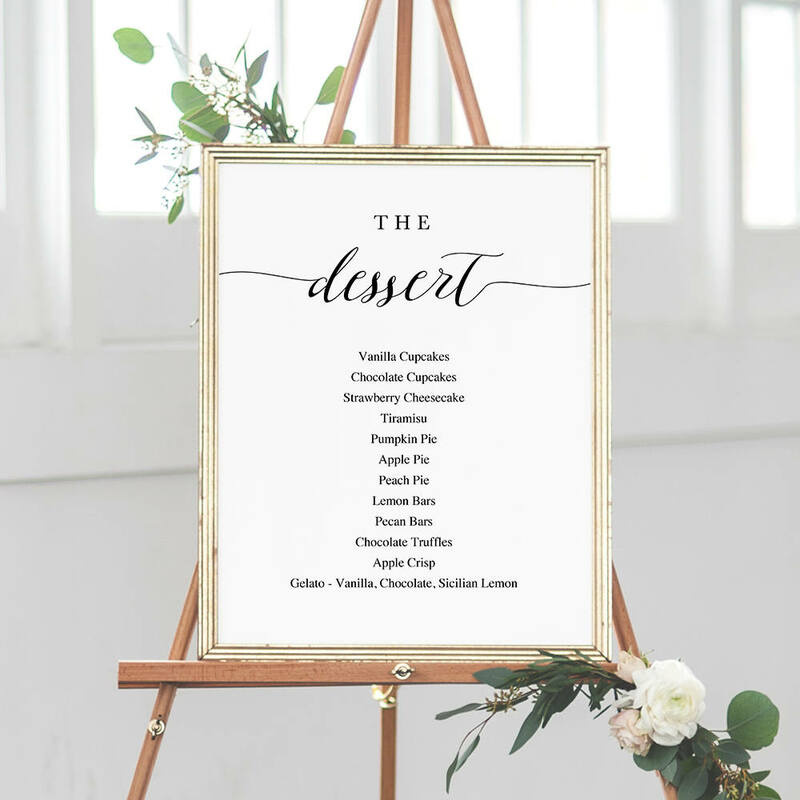 Don’t feel as if you need to stick with the traditional kind of food menu you’re bound to find at every wedding reception. For example, the shrimp cocktail may seem like a wedding staple, but if it isn’t something you’re in favor of, then no one’s forcing you to serve it at your wedding. Put a spin on the tradition by adding menu items of your choice. You could discuss things with the head chef of your caterer regarding dishes you wish to improvise or switch up a little. In doing so, remember to incorporate your likes and dislikes, while still keeping your guests close to mind. You might be interested in burger menu designs and examples. 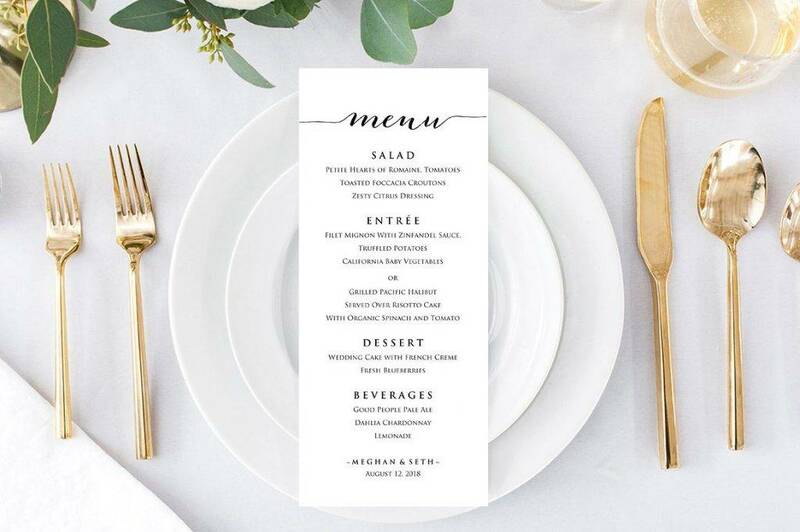 There’s nothing wrong with being meticulous about every single detail of your wedding, even if it’s with your menu design. 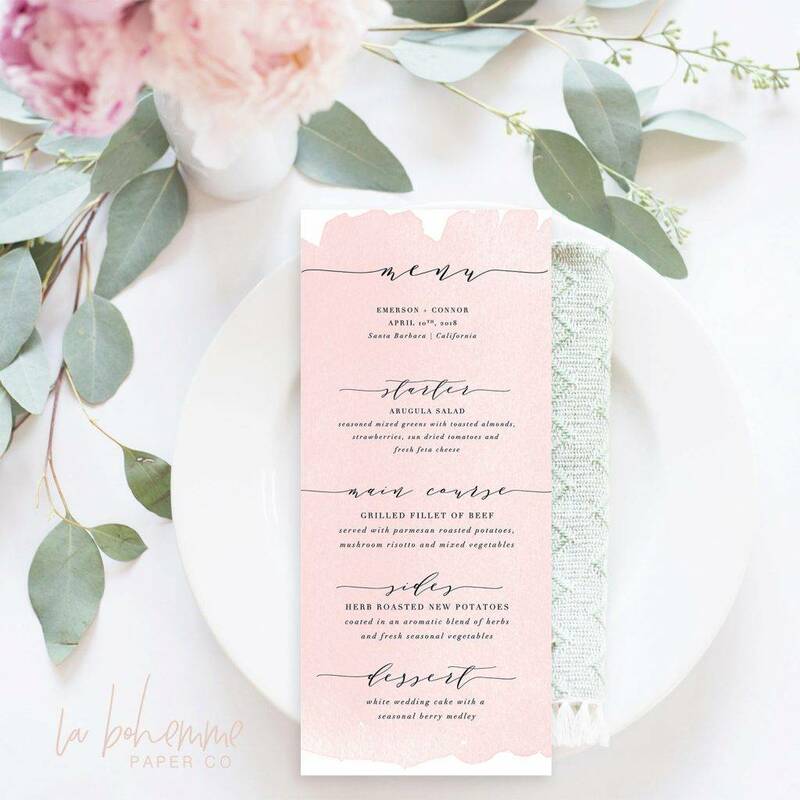 Unlike a regular restaurant menu, wedding menus are more personalized in form, bearing unique details and embellishments that are specified by the bride and groom. 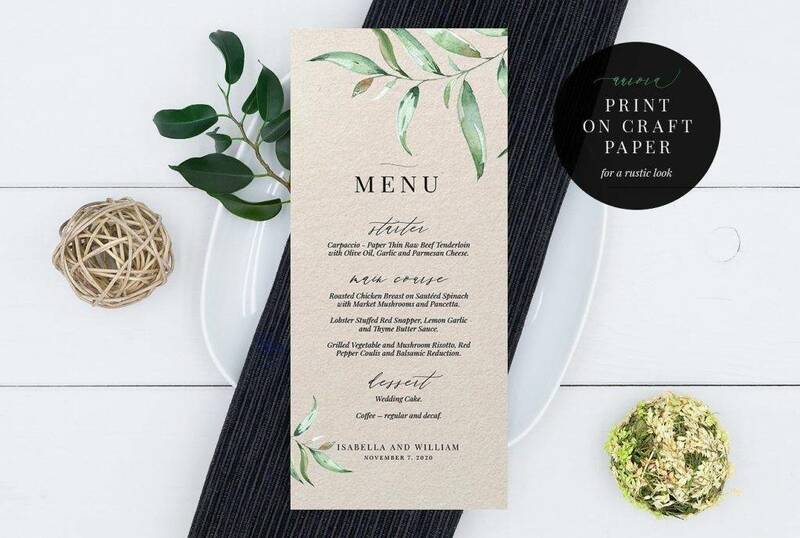 For this reason, it’s important to find the right balance between every element in order to craft the perfect menu design. 1. Make it subtle yet elegant. 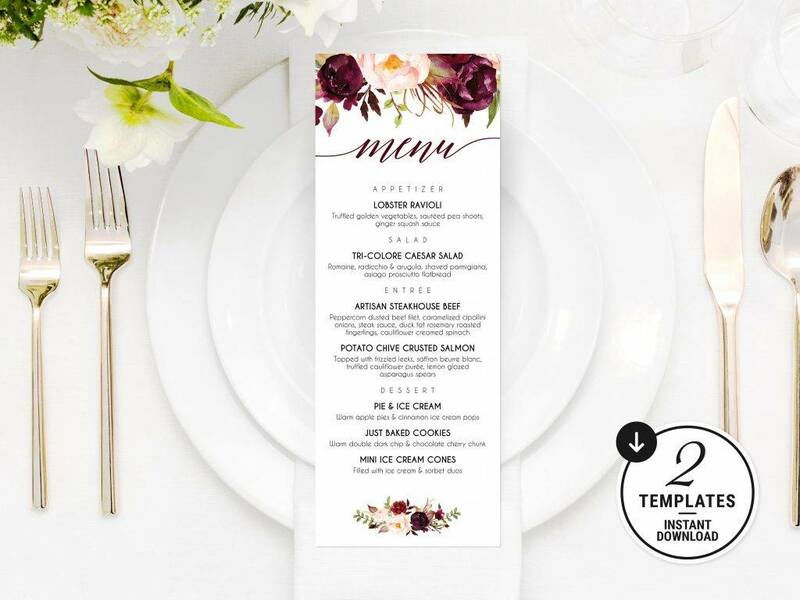 Wedding menu designs are created to complement a certain theme or décor of the wedding reception. Since they’re meant to blend in with the rest of the decorations, it’s important to keep it as subtle as possible. Refrain from creating a design that would overshadow the rest of the venue arrangements, such as the flowers, table setting, buffet table, or even the stage, but instead, make it seem like the menu is the last piece of the puzzle left to perfect the whole arrangement. 2. Focus on the flowers. Think of it as the centerpiece that lets everything else fall into place. Apart from the menu, your floral arrangements are one of the main attractions of the reception. 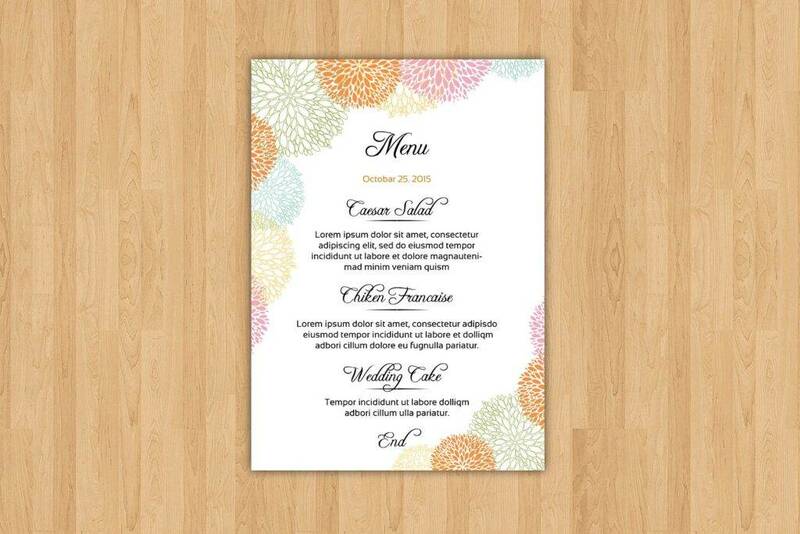 For instance, a blue menu design would look great alongside a white table cloth and blue flowers. The pop of color can add a certain level of elegance to the overall ambiance of the event. You can also incorporate flowery patterns into the design to live up to the theme. You may also see creative wedding menu ideas. 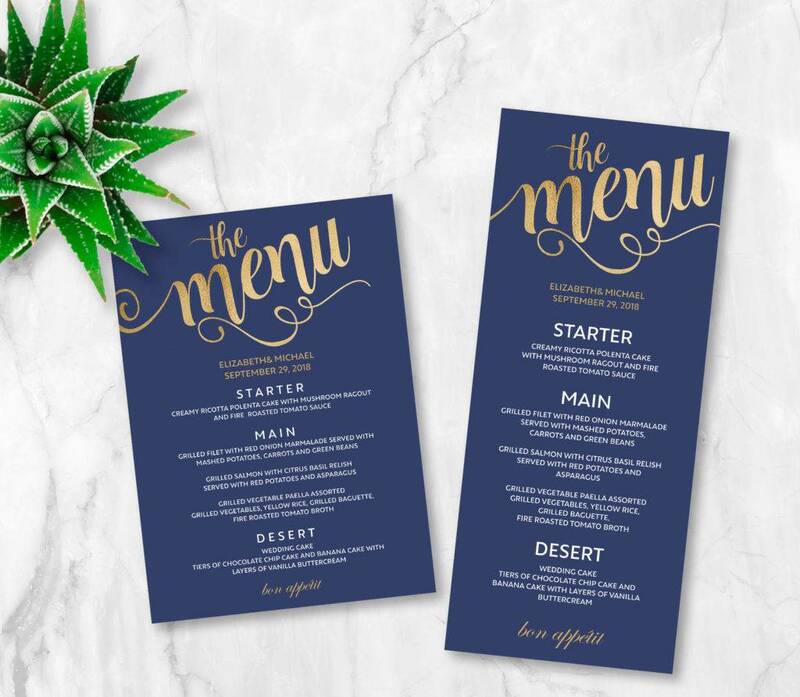 While you do have the creative freedom to create an eye-catching menu design, try not to go a bit too overboard with it. 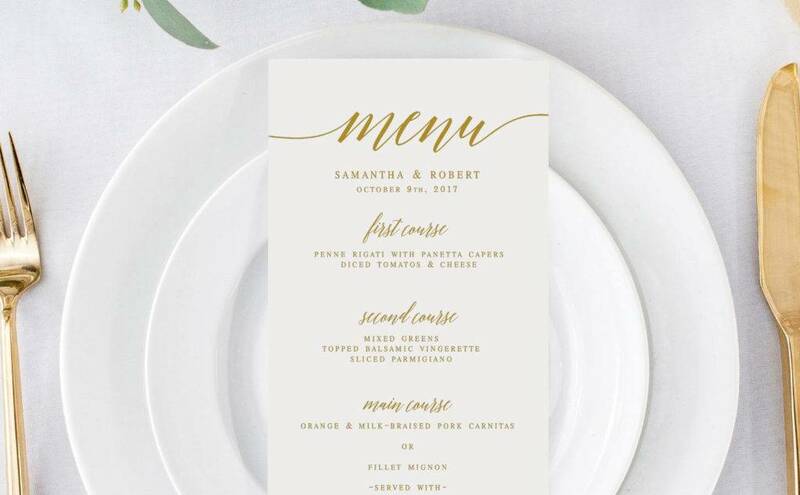 Calligraphy can be a beautiful addition to a wedding menu, but it can also be hard to read when it isn’t applied correctly. 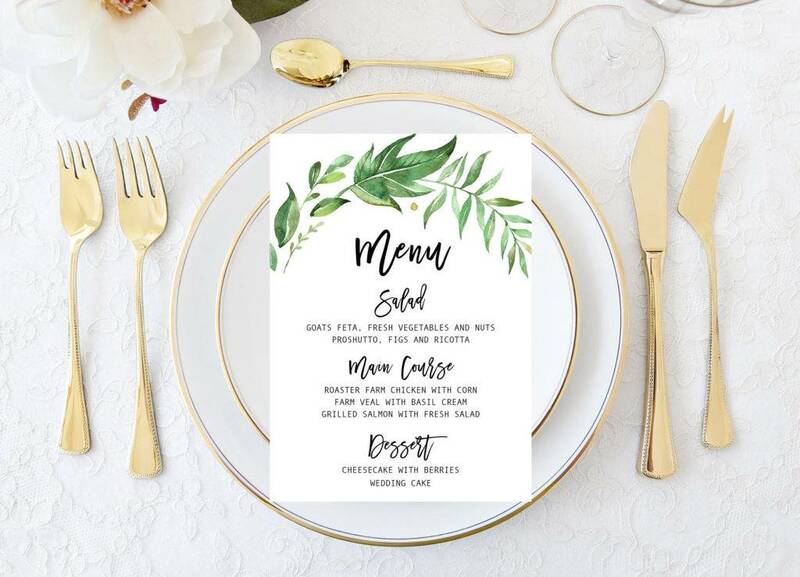 Keep in mind that elegance doesn’t always constitute to curves, flowers, and swirls, so if you are aiming for an elegant wedding menu design, focus on simplicity instead. 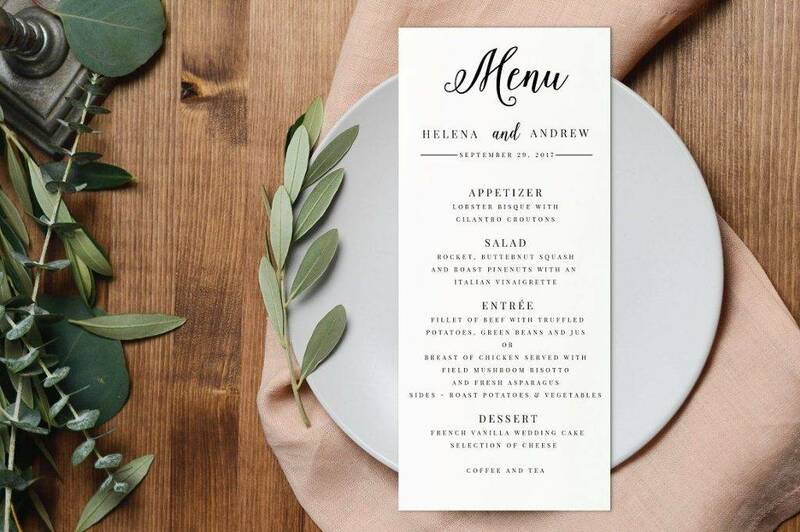 It might seem weird to put a logo design on a wedding menu, but you’d be surprised how many couples have opted to create their own wedding logo to honor their special day. This is often used as the central design element for guests to remember. 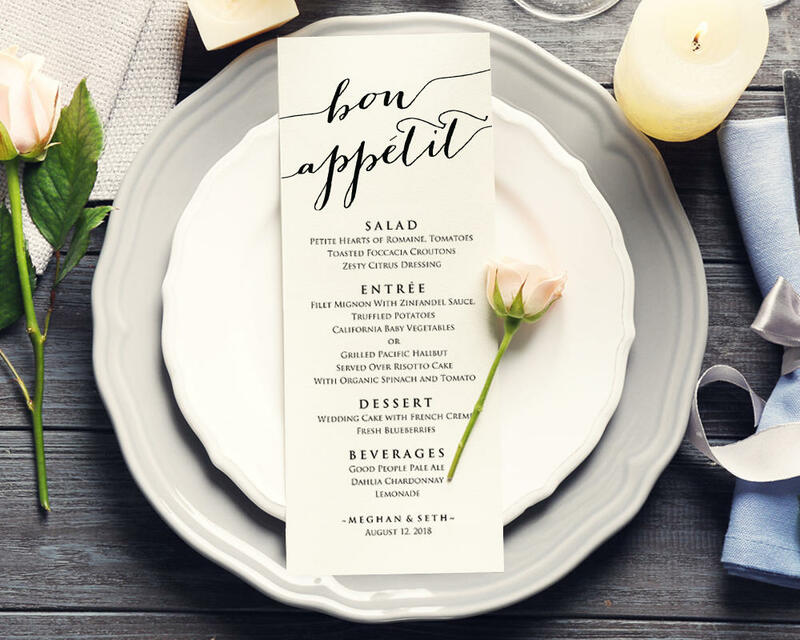 Most brides and grooms like to incorporate their initials, followed by their wedding date, into the monogram in order to emphasize the purpose of the menu card. 5. Choose design elements wisely. 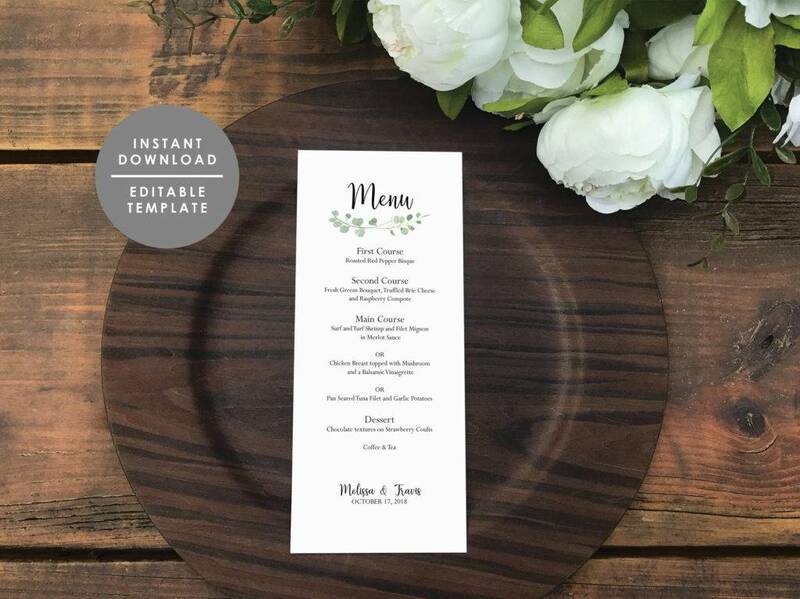 If you really want a design that would stand out, then you might want to steer clear from the cliché design elements that many couples have used in their menu. As an alternative, you could employ modern, elegant embellishments that your imaginative mind can think of. Ribbons, buttons, sequins, and glitters can easily add that pizzazz factor to the design as well. You may also like examples of a drink menu. Wedding planning can be a stressful experience for any bride and groom. It involves a lot of sacrifice and sleepless nights, where you spend numerous hours trying to perfect every single aspect of the event. Developing your wedding menu is just one of those responsibilities that need to be attended to properly. But with all the chaos happening all at once, it can get pretty overwhelming, so try not to spend too much of your time and energy on this single piece. Remember, it’s not about the menu — nor the food items being listed on it — but it’s about the sacred gathering that celebrates the union of two souls as they enter a new chapter of their lives together. You may also check out wine menu examples.